Fox's lightweight fork platform for the XC-inspired rider. Starting at 2.98 pounds, the 32 Step-Cast (SC) fork is Fox's lightest cross-country fork ever. 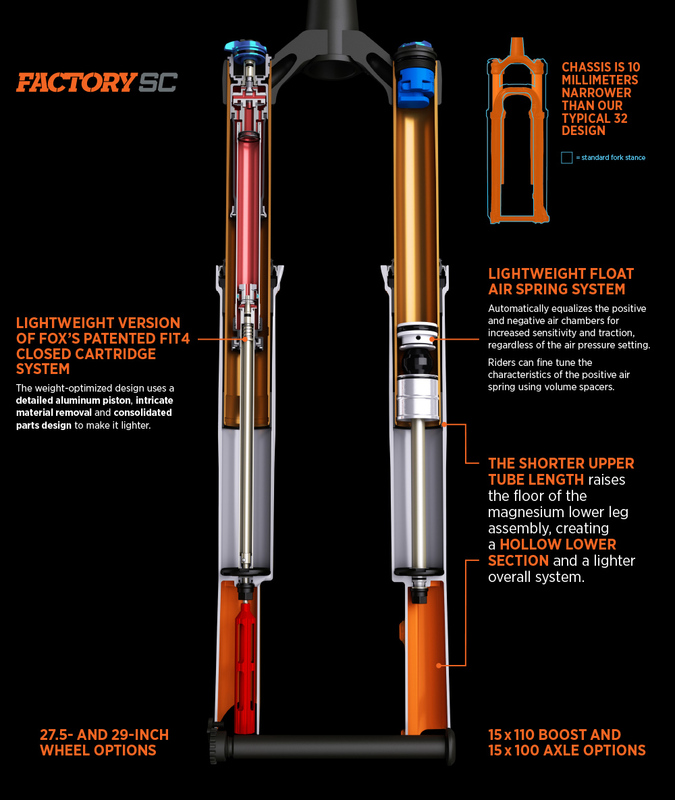 Now in its fourth generation, the patented FIT4 (FOX Isolated Technology) closed cartridge system provides three on-the-fly compression damping positions—Open, Medium, and Firm—to adapt to varying trail conditions. Factory Series forks feature an additional 22 clicks of low-speed compression adjust in the Open mode, allowing riders to fine-tune their exact damping preferences. The FIT4 cartridge damper was redesigned based on Fox's award-winning HSC/LSC damper, resulting in a much higher performing damper across all forks. This year, the FIT4 damper received an updated tune that provides more sensitivity while maintaining support. KABOLT 100....Working with Fox’s Racing Applications Development team, Geoff Kabush asked for a lighter, bolt-on axle that would allow for quick wheels changes during a race. The Kabolt was born and soon other FOX athletes – from enduro racers to slopestyle riders - were asking for it.